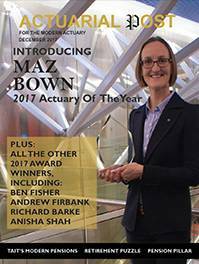 Maz Bown is Head of Insurance Risk at Aviva Insurance and has won our Actuary of the Year Award for 2017. 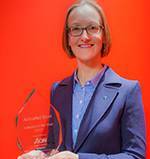 Celebrating her Actuary of the Year win, Actuarial Post took the chance to sit down with Maz to ask her about her career and reaction to winning Actuarial Post’s coveted award. What was your initial reaction on winning this award, nominated and voted for by your peers? Since hearing that I’d been nominated for this award and throughout the voting, I’ve been enormously grateful to all my peers, colleagues and friends for their support, and in particular, to my Aviva family worldwide, for their enthusiastic and unwavering delight in the opportunity to recognise ‘one of their own’. I still can’t quite believe that I’ve been so fortunate to have won, and my initial reaction was of excitement and quiet pride at this achievement.